Designers and scientists are different. We think, communicate, and interact with the world in vastly different ways. For instance, designers often develop evocative renderings of our creations, varying in style, but of a similar nature to the image below: a collage perspective showing a scene explaining a design concept. For a designer, this form provides three-dimensional shape to the design, and helps communicate cues for spatial arrangement, the relationship of the building to the landscape, and the intention of human experience such as arrival and wayfinding. The challenges are immense, but to expand the potential of projects we need to mediate the disconnect between science and design, building on positive strategies by ecologists and designers to increase collaboration and success. What, however, would a scientist think of this image, and how would they interpret meaning? They would perhaps look at the vegetation and if it was appropriate to the site conditions, interpret the shape and size of patches of habitat and the ability to provide for the needs of different species, and perhaps wonder, again, why designers love to place flocks of birds in all of their drawings. Conversely, scientists have a process and protocol for communication, using a distinct language, graphic style, and structure that allows for interpretation and analysis using proven scientific methods. Scientists hypothesize, reason, test, and verify, and then present this information in a format that can be inaccessible and daunting to lay-people, and perhaps similar to a scientist trying to derive meaning from a designers drawing, can be downright confounding when attempting to extract useful information to inform their work. 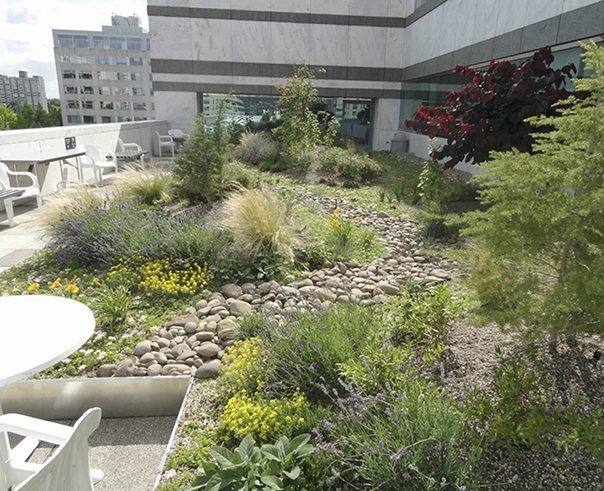 Ecologists and landscape architects, however, are both key actors in preservation and enhancement of biodiversity in cities, and have unique opportunities to inform one another in the creation of environments for urban ecological design. Yes, we’re different. Our challenge, then, to achieve these shared goals is to better align the key strengths of each discipline—focusing the scientific analysis to achieve accessible and applied solutions, while integrating design synthesis that achieves cultural goals and rigorous, measurable ecological outcomes. There are many good examples of collaborations that result in positive urban habitat for flora, fauna, and people, often emerging from these interdisciplinary efforts. However, firms that include both designers and scientists on staff (i.e. integrated design/science firms) or even the inclusion of scientists on most design and planning teams is still relatively rare. The disciplinary boundaries continue to perpetuate a disconnect of academia and practice, resulting in scientific research that is inaccessible, offering little to designers, and design solutions that privilege aesthetics goals and offer shallow, ‘boutique’ ecologies lacking function. As an extension of the TNOC’s January Roundtable “You say po-TAY-to. What ecologists and landscape architects don’t get about each other, but ought to”, contributor Mark Hostetler from University of Florida invited some folks, including myself, to a similar session at the recent International Urban Wildlife Conference in San Diego in early June. While the focus was on urban wildlife habitat, the broader idea of communication between scientists and designers offered another opportunity to discuss the dual issues between ecologists and designers. The concept of “Crossing the Design-Science Divide” provides the context for my part of the discussion, which is briefly summarized in the remainder of this essay. As some inspiration for my talk, I was thinking in terms of art and science, and stumbled upon some amazing images from artist Xavi Bou entitled Ornitographies, “…a balance between art and science; a nature-based dissemination project and a visual poetry exercise but above all, an invitation to perceive the world with the same curious and innocent look of the child we once were”. The chronophotographs depict the vibrancy of the movement of species of birds in new ways, and the child-like ‘way of seeing’ provided an apt metaphor for the distillation of complex ecological systems and visualization, with the result blending beauty and utility. I was also thinking back to successful collaborations with interdisciplinary teams, including the winning entry for the Metro Integrating Habitats Design Competition in 2008, which had a goal to explore and create habitat-friendly development strategies. Our project, which included landscape architects, architects, engineers, wetland and ecological scientists, illustrators, and more, developed a concept of urban ecotones. An ecotone is the transitional zone between two biological communities, such as the shift from a forest to a grassland. Because the ecotone blends the species of each distinct zone, these areas, among other features, develop a high level of diversity. The usage was ecological and social in our design—to protect wetland enhancements, mediate impacts of climate change, and create an adaptable, flexible, and resilient big box development. The Integrating Habitats Design Competition sponsored by Metro (2008) sought multi-disciplinary, collaborative designs of the future that integrate built and natural environments. 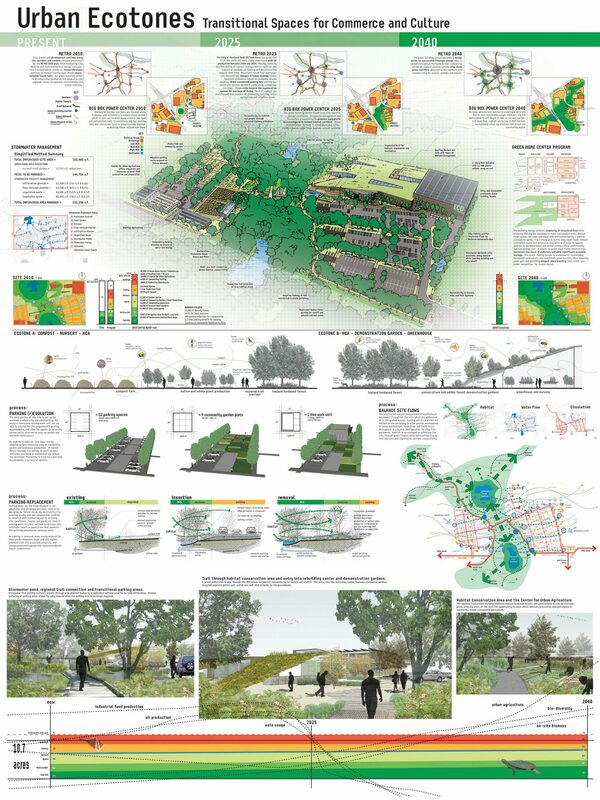 The winning design proposal for Urban Ecotones: Transitional Spaces for Commerce and Culture, embodied this ideology through a team of scientists and designers that developed a plan for a big-box store that was adaptable to future climate change and restoration of natural lowland wetland habitats. Image: Jason King, Brett Milligan and Bruce Rodgers. Click on the image to expand. The challenge of working with designers and scientists on wildlife friendly concepts was evident in a number of ways, including differing language, methods, and workflows. One way to achieve common ground came in starting to map out, on the site, specific flows, including biological and physical, as well as social patterns that identified both potential conflicts and opportunities. 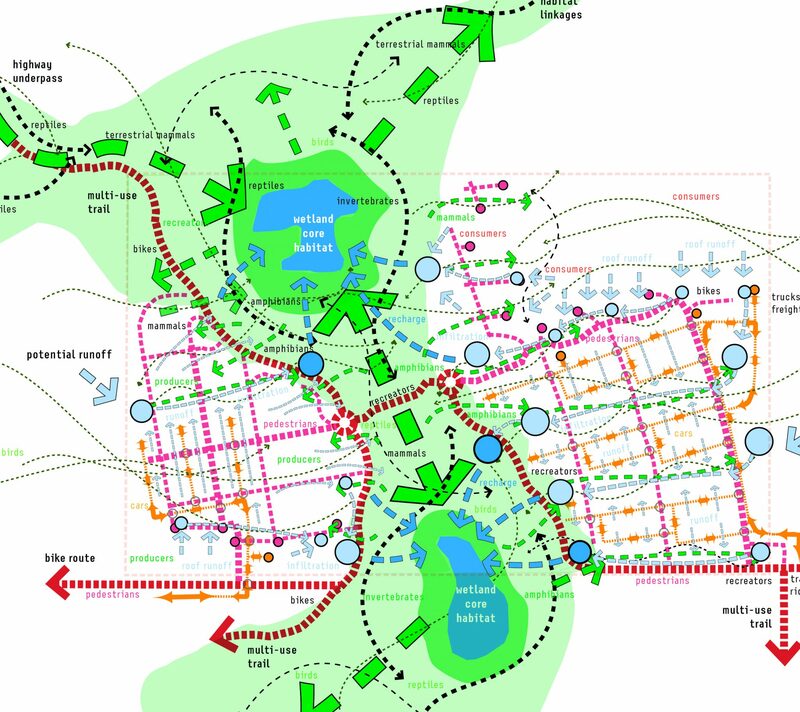 The resulting diagrammatic chaos is indicative of the challenge of mapping complexity, but also allows for a spatial investigation, by zooming in on key zones and seeing opportunities to engage with specific system, aesthetics, and technical requirements around stormwater for instance, as a functional amenity. The interdisciplinary mapping between ecologists and designers was an opportunity to visualize complexity in a way to aid in decision-making. We developed ‘flow diagrams’ of flora, fauna, water, goods, and people on-site to identify conflicts and opportunities. Image: Jason King. Click on the image to expand. Beyond the larger theoretical framework of urban ecotones, we are able to use this information in design strategies, applied to specific site areas to define gradients of protection and integration. 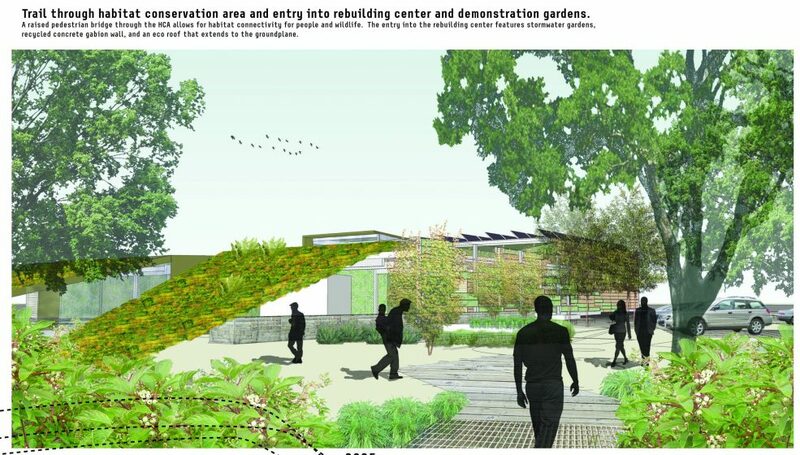 This is illustrated in this section showing the transition from large-scale composting facility to community garden and plant production nursery, transitioning through recreational space and interior habitat patches, all of which allow flows of materials and resources for a number of species. Sections show simplified relationships and highlight ecological flows of species and resources across the ecotone, from developed edges to natural buffered wetland resources. Image: Brett Milligan and Jason King. Click on the image to expand. On a smaller scale, the concept of small scale patches of habitat, even on small scale and urban projects, provide value in urban areas that are perceived to be habitat free. The Move the House Apartments project in Portland allowed for investigation of which habitat would be able to live on small infill projects, and what strategies, such as plantings, could facilitate a successful mix of food, forage, and shelter for a number of species. 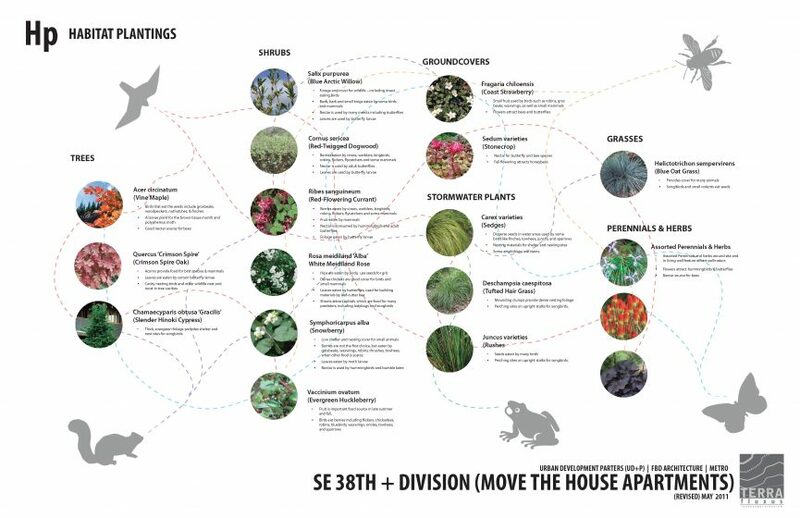 The relationship of planting species to provide food, forage, and shelter to multiple species is outlined in this diagram for Move the House Apartments, a dense infill project in Portland, Oregon. Image: Jason King. Click on the image to expand. This is similarly explored in the context of green roofs, which provide not only stormwater management opportunities and aesthetic value to building residents, but provide proven options for viable urban habitat. The Bonneville Power Administration Headquarters that I designed in 2011, mixed topographic variation, substrate, three-dimensional habitat, and seasonal variations of flowering plants to expand the notion of flat sedum roofs to connected patches of urban wildlife habitat. Information of the right kind, in sufficient detail, and up-to-date, is essential to perceiving the city as a whole. The generation, collection, assimilation, and dissemination of information—information about the natural environment of a specific city, research on the urban natural environment and the investigation of potential applications of that research, and reports of successful case studies—are major but essential tasks. … More applied research, for example, is needed within specific scientific discipline, as well as across disciplinary boundaries. While the projects above provide a small snapshot of support from designers to maximize habitat, there are a number of questions that need to be addressed to avoid mistakes and maximize value. The definition of value changes depending on each project, but in this case our aspiration was true integration of ecological wisdom into the design process and solution. The opportunities for cross-disciplinary work informed by research is immense. There are, however, some key challenges. I presented at the 2014 Ecoroof Symposioum in Portland, and was inspired by the above quote as well as Ms. Sprin’s keynote address. My presentation was a meta-analysis on ecoroof research literature, and analysis of how this information could better inform designers. I discovered a total of 202 peer reviewed articles on green roofs from over 52 Journals, spanning habitat, stormwater performance, energy, and more. While tapping into the research was one facet of this study, the other was to illuminate the lack of access to relevant research. 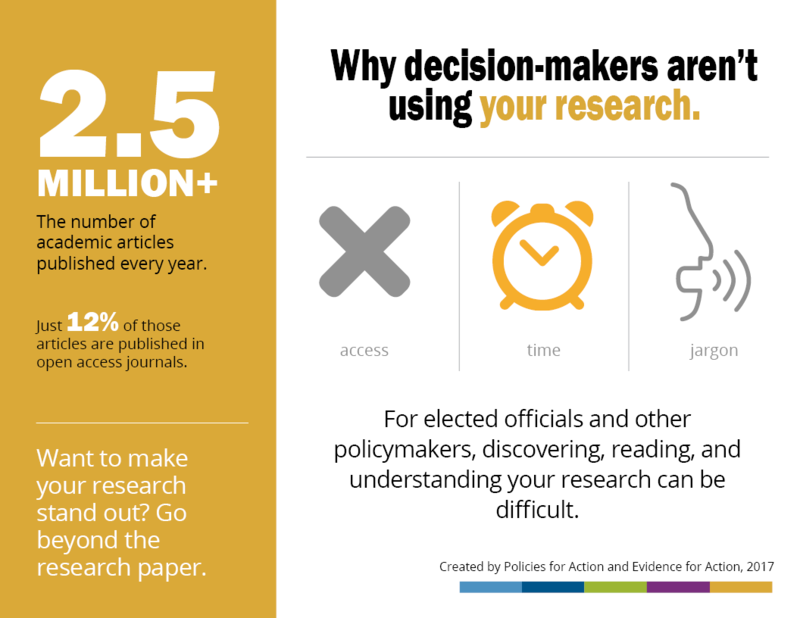 Academics benefit from access to a plethora of research material through university and other supported means, while professionals are limited by paywalls and high costs of journal subscriptions and individual articles. In fact, of the 202 research articles I found, very few of them were available from open access journals. If I were to purchase them on an article-by-article basis, the total cost would be over $5,000. While there are still barriers, a number of efforts provide guidance to moving forward with better collaboration between designers and scientists. Firms such as Andropogon have made a commitment to this evidence-based process, looking at operations and maintenance, with research documented on a separate Andropogon Research site. These design-science firms provide a model for new modes of practice. Landscape ecology has emerged in the past decade as an important and useful tool for land-use planners and landscape architects. While professionals and scholars have begun to incorporate aspects of this new field into their work, there remains a need for a summary of key principles and how they might be applied in design and planning. This volume fills that need. 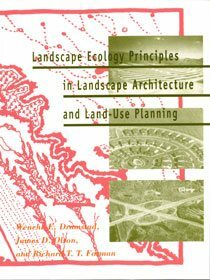 It is a concise handbook that lists and illustrates key principles in the field, presenting specific examples of how the principles can be applied in a range of scales and diverse types of landscapes around the world. Chapters cover: patches — size, number, and location, edges and boundaries, corridors and connectivity, mosaics, [and] summaries of case studies from around the world. We need more examples like this, not to over-simplify concepts, but to deliver key principles and research in visual format to develop the shared language and allow designers to ask the right questions. Another good model for research and design is healthcare, which has developed robust resources for evidence-based design (EBD) that is driven by the need for credible and defensible solutions that support theories of the environmental benefits of health outcomes. The Center for Health Design has pioneered the connection between designers and researchers through advancing best practices and empowering people with research. Similarly, sites like Research-Design Connections are an example of both a clearinghouse of information and synthesis of research accessible to designers. From their site, they connect “what cognitive scientists and other researchers in the social, design, and physical sciences have learned about how design affects human thoughts and behavior”. And also offer “design-relevant info in concise articles—some covering a single study, others integrating info from several analyses into a topical report, all written in everyday language—no jargon”. These types of evidence-based strategies, although more mature in a healthcare setting, can be expanded as models for sharing of urban ecological knowledge. Adoption of ecological principles in design can also be disseminated through certification and green rating systems. The most well-known is LEED, which incorporates site elements, however with wide consensus that it is more building-focused. This has opened up additional territory for site-based certification systems like the Sustainable Sites Initiative, which is a much more holistic framework informed by designers and scientists. 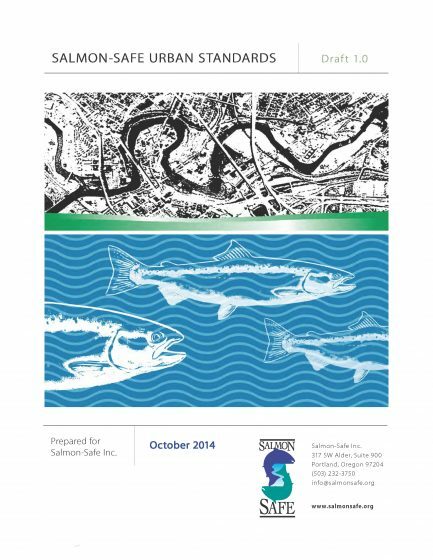 An ecologically informed system in the Pacific Northwest is Salmon Safe, which provides an example of a more focused, site scale interdisciplinary approach that focuses on urban ecological systems. With origins in certification of farms, vineyards, and parks, the system now provides opportunities for evaluation of campuses, urban projects, and infrastructure. Certified projects follow a set of standards, developed by designers and scientists including engineers, landscape architects, natural resource specialists, ecologists, and experts in integrated pest management. I worked on the team developing the urban standards, which has opened up a new realm by translating this ecological focus into strategies for dense, urban projects. The system has been embraced by Seattle Developer Vulcan Real Estate, who shares a commitment to the system for their projects. Multiple projects have been certified, as well as contractors accredited for their commitment to these principles. The challenges are immense, but to truly expand the potential of projects we need to mediate the disconnect between science and design. To do this, we need to develop an understanding of new ways of crossing the divide, building on a number of positive strategies to be employed by ecologists and designers to increase collaboration and success. We need to create opportunities for building research into projects, and to expand the concept of “evidence-based design” aided by a greater understanding of urban science, to better inform flexible design solutions. The solutions aren’t just generative, but could also be employed in post-occupancy evaluation to measure success and provide feedback loops for subsequent projects. We also need more opportunities to create teams that yield ecologically informed design strategies and expand the potential through use of habitat-focused certification such as Salmon Safe. The goal is to shape and expand the potential of biodiverse projects by developing shared language, and translating facts into ecological values and principles. Together, these strategies can reduce the impacts of urbanization on biodiversity and enhance urban wildlife through better collaboration. We need to continue to gather stories of challenges and opportunities—and successes—in melding science and design. These stories need to be shared. 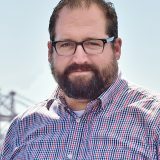 Thanks Jason – it is intriguing how relatively overlapping professions such as design and scientists struggle to communicate, let alone when we bring in actors that sit quite far out of the design/science spectrum including finance, policy, sociology, social services, health and every community interests. In my experience (as a designer), nothing beats face-to-face co-creation where both evidence-based and value-based themes can overlap. Designers have often taken a hands-off position, designing from a distance. I have a feeling that the management of such complexity will become one of the critical future roles for the designer. Excellent article and the recommendations — in my view — are spot on. One comment I would make is that the main difference between scientists and designers is that scientists create knowledge about the landscape and human interaction, and designers apply it to create improvement in the landscape. If designers are unaware of the knowledge of how the landscape works or how people interact with it, then they obviously cannot perform their duty to shape the landscape in ways that bring about improvement in the human/landscape condition in any predictable way.